That's what happened to Yvette Forshaw all because a para-motorist - a machine-driven glider - took off to the side of her when she was out riding with her daughter, Amber , 24, along a bridleway on the South Downs near Devil's Dyke, Surrey. Says Yvette, "My pony spun into the barbed wire fence and bolted, ripping my hand, arm and body till my stirrup caught and I fell off. I could hear my daughter screaming to the para-motorist to get his machine down. "I don't quite understand how he didn't realize that we were approaching as he was up in the air, with a bird's eye view." When she left hospital, Yvette was told by the Bridleways Association to contact the police. The police said there was nothing they could do as "the bridlepaths are for everybody." 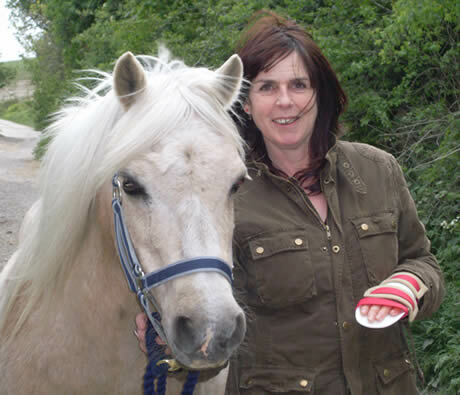 She contacted the British Horse Society and both the West Sussex highways authority and rights of way officials.
" The BHS and the South Downs Joint Committee were very supportive," says Yvette. "They wanted to know of any other difficulties riders had experienced with these craft. 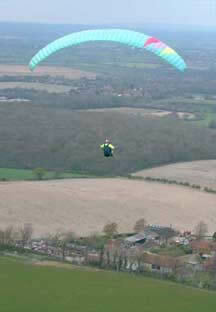 The Southern Hang Gliding Club contacted the para-motorists on Yvette's behalf. The para-motorists assured her that " all para-glider pilots whether free flying or under power, are well aware of the unpredictable reaction from horses and the predicament that horse riders may experience when in close contact, just in the way that all motorists are concerned when encountering horse riders on the road. This is basic airmanship that every pilot is taught throughout training." First, some horses are spooked by para-gliders, some are not. Said one paraglider, "From my experience of flying for over 30 years around Devil's Dyke, there seem to be horses that get easily spooked and others that do not. At the bottom of Truleigh Hill, horses are grazing quite happily in the paragliders' landing field. Serious accidents such as yours are rare. We have witnessed on days when all flying activities have been stopped to allow for horses to walk by, that some horses have been distraught even to pass parked vehicles or people just standing around. We understand this and always try to accommodate horse riders as best as we can." Second, they came up with some suggestions to resolve the conflict between riders and para-gliders. High visibility clothing worn by riders could help us spot approaching horses from further away, as is widely used when riding on roads. Would the open grass part of the field be safer for riders rather than the hard flint track next to the fence, and allow riders to trot or canter across the field to reduce the exposed time? Warning signs when approaching the field from the South to warn riders of possible conflict with flying activities (and zorbing etc), giving them a chance to dismount near gates and problem areas. We would endeavour to fly on the West and North sides of the field as much as possible, leaving the bridleway on the East side clear whenever the wind direction allows us to. " Says Yvette, "The onus appears to be put on the riders. Even if the para-gliders move to the north side of the field, it is still near a bridleway. We are not meant to leave the bridleway, and we shouldn't have to put ourselves at risk by trotting or cantering past activities which our horses are already worried about. "We can see the activities clearly and do not need signs. We expect the people doing the activities to act responsibly. We shouldn't have to dismount. If a horse is suddenly startled and goes into flight mode, it is not going to make any difference if you are leading or riding the horse. "We do usually wear high viz if on roads, at dusk and if riding further afield but as we were going off road, it was a clear sunny day, the route is well used and near to our yard we didn't think it was necessary. Anyway, the para-motorist further up the field stated that he could see us approaching." Whatever the para-gliders say, the result says Yvette, is that fewer and fewer riders are riding along the bridleway on top of the Downs. They are just too scared of what might happen to them and/or their horse. "A friend told me she had heard about my accident as she had to turn her horse back as the same machine- powered gliders were skimming the grass on another bridleway in front of her. On her return to the yard she was told she did the sensible thing. "The air powered hang gliders are not as big a problem as they take off and land away from the bridle path and usually appear to go towards the Weald. The machine-powered gliders, however, take off and land anywhere and do not seem to be so reliant on weather conditions which makes them difficult to avoid." In the past, the 100-acre field where Yvette's accident took place was once almost only used by riders. Today it is used for everything from para-gliding and para-motoring to kite flying, falconry, zorbing and mountain boarding. Not to mention the walkers and mountain bikes who use the bridleway. "I know many riders who are now just too scared of riding across the field," says Yvette. "We have problems with these machine -driven gliders. They park up and take off next to the bridle path. We have to shout at them not to take off. 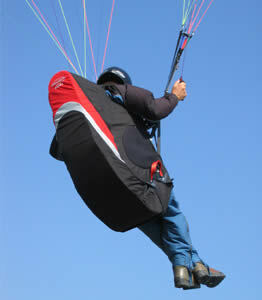 "They should take regard of what/who is approaching when taking off, landing and trying to untangle their para-motors. They should keep their vehicles, windsocks and para-motors away from bridle paths. They should take off and land from the same spot, not just anywhere. They shouldn't skim over the bridle paths, not realising that horses are scared of big gliders just appearing and that horses see things from the side and behind them because of the position of their eyes. " Yvette makes a final point. "Interestingly the para-motorist, who caused my accident, did not made any enquiries about my well being until the Southern Hang Gliding Club contacted them with my suggestions as to how to make things safer for riders! Even then it was with suggestions as to what riders can do when they are flying! "I didn't think I could act more responsibly than staying and riding at a walk on a bridleway. " "The Southern Hang Gliding club, however, contacted us as soon as they heard about the accident even though they weren't involved and do not use that field. "I am not going to pretend that what happened to me as a result of what the para-motorist did wasn't painful or horrible. It was and still is although the wounds are healing well. I am also missing being active as I like to cycle and ride. But at the moment I feel very fragile and tire easily so even walking is not an option. "Doing everything one handed is challenging too. And I still have to return to East Grinstead every week for physio and have to rely on people's goodwill to get me there as I do not drive and am not quite up to journey by public transport and foot yet.
" I just want our bridleways to be safe for us to ride on as I would hate someone else to have an accident." If anyone has experienced difficulties because of these motorized gliders please can you contact Yvette so that she can forward the concerns to the British Horse Society and the relevant authorities who are looking into the impact of these activities on both the Downs and on riders.